About the Washington School Parent Teacher Organization and Foundation, Inc.
First and foremost: every parent, guardian, teacher, and principal representing a child attending Washington Elementary School is a Member of the Foundation. The Parent Teacher Organization (PTO) is an elected group of individuals that serve as representatives for parents, teachers, guardians, students, and staff at Washington Elementary School. We improve the quality of our school’s educational experience by creating community-building events, raising funds to meet budgetary requirements, and providing a welcoming environment for all members to participate. As a 501(c)(3) non-profit organization, and as dictated by our by-laws, we are required to publicize our meeting minutes and financial statements. We strive to be a transparent organization that is inclusive to all members. We work closely with the Santa Barbara Unified School District and Washington Elementary School faculty and staff. Every parent, guardian, and staff member is automatically a member of the PTO organization. There are no fees or dues required – simply being registered at Washington Elementary School makes you a member! We annually elect our Board of Directors and seek parent volunteers throughout the year. Meetings are held on a monthly basis during the school year and all PTO members are invited to attend and encouraged to participate. Create a challenging, relevant, and engaging instructional program provided by a staff working interdependently and in conjunction with parent and community volunteers that allows all students to master grade level standards. Create and sustain a comprehensive and standards-based enrichment program that includes the areas of science, visual art, physical education, and instrumental music. This program is meant to extend, enrich, and deepen the core academic program. Maintain a healthy, supportive learning environment by engaging all students, staff, and parents in a discussion about the Washington Way (Respect and Responsibility). Create and maintain an educational nutrition program that allows students to grow their own food, cook their own food, and eat their own food. I thought public school was free? Why is the PTO asking for money? Tuition is not required at public schools, but there are still many financial needs that are provided by the families in attendance. Without the PTO Foundation support, Washington cannot afford many of the educators and educational resources our children benefit from each year. How many fundraisers will there be throughout the year? In addition to our Pride Campaign at the beginning of the year and Move-A-Thon in the spring, there will be many other smaller opportunities to give back to the school and to the foundation. However, Pride is the cornerstone for setting the budget and we want to make sure that our incredible resources at Washington receive full funding. 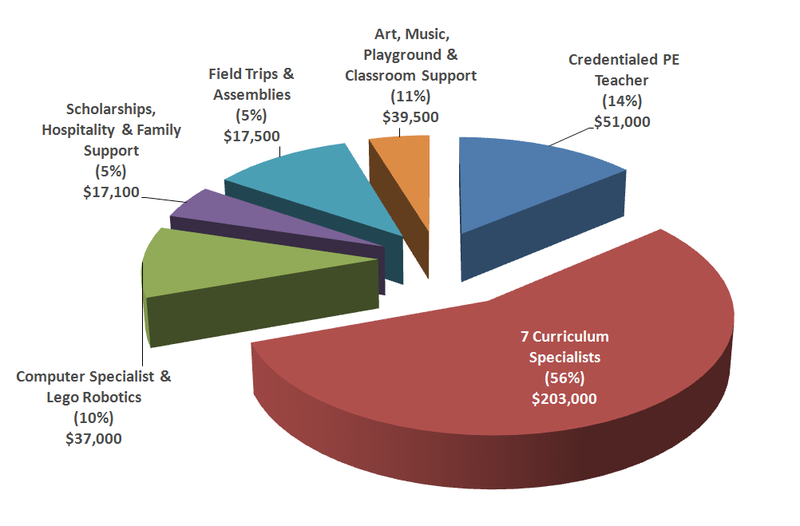 The Washington School PTO publicly posts its budget every year on our website and include a graph of how the funds are distributed each year. In short, the majority of the funding goes directly to support our assistant teachers, physical education program, science technology engineering & mathematics (STEM) program, and variety of other in-classroom support items and programs. Can I make a donation of any size? Absolutely! We want ALL families to be proud of their place in our community at Washington. Determine an amount that is right for your family and donate with PRIDE that you are part of something very important. Can I break my donation into smaller pieces? Many families chose to set up monthly payment plans with recurring payments that occur for a preset number of months. Click on “Donate” in the upper right corner of the PTO website to learn more about how to setup recurring payments. We want each child to be proud of their place at our school. Talk with your family about how you think it is important to be part of a giving community – no matter what the amount is. Let your children know that you are turning in an envelope…or better yet, let them be the ones to put the envelope in the box! The smiles on their faces are priceless, knowing that they are giving to their school. I donated last year. Should I give again this year? Please do. Each years’ budget is independent from previous years. Is there a company-matching program? Yes! Several employers within our community have programs available. Please inquire directly with your employer to see if they’ll help support Washington or contact any PTO member for a list of previous supporters. Your sealed donation envelope is only opened by the PTO treasurer and your family’s name and donation amount are not shared with anyone other than the treasurer.